One of the little mysteries I’ve been meaning to research for some time has a bit of a family connection. This past week, I finally had the opportunity to delve into it, and the results were far different than I ever anticipated. My great-grandparents were married on May 2/15, 1908 at St. Nicholas Russian Orthodox Cathedral in New York City. As someone who specializes in that particular era, and who has focused a lot of research on events and figures at St. Nicholas at the time, it’s always been a bit of a curiosity as to which priest married them. With the number of notable clegymen in and around New York at the time, and being a historian, I just had to know. Last week, while having lunch with my grandmother (their youngest daughter, now 97 years old), I asked if she had their marriage certificate. A few minutes later, she retrieved a rather fascinating set of documents from a file drawer, which included not only the answer to my original question, but also led me to something I think our readers would find interesting. In 1916, my great-grandparents,who had moved to Detroit, wrote to the cathedral and requested the metrical records for their wedding and the baptisms of the three of their children who were born in New York. In return, they received pre-printed forms designed for this purpose, with the requested information from the metrical books filled in by hand by Vsevolod Andronoff, the cathedral’s deacon, and signed by Fr. Leonid Turkevich (the future Metropolitan Leonty), then the Dean of the Cathedral. In the record for the marriage, I was surprised to find the name of a priest I had never seen before: Fr. Ilia Zotikov. When I got home, I searched through the print and online sources I normally use to find information on priests, and found surprisingly little. Other than the fact that he was in New York at the early part of the 20th century, Zotikov seemed to have fallen into obscurity. Then, like any crafty, 21st-century researcher, I ran a Google search in Russian. Dozens of hits popped up. This is where the story became something quite interesting. In 1922, Fr. Ilia Zotikov, like untold thousands in his vocation during the Soviet era, was forced into the murky abyss of the Soviet prison system, where his personal and professional lives were interrupted by a dizzying series of arrests, trials, imprisonments, exile, and ultimately, death. Of course, Orthodox Americans are quite familiar with the Hieromartyr Fr. Alexander Hotovitzky, who is depicted and venerated in iconography throughout the world, and whose biography has been published far and wide. This has as much to do with the circumstances of his various trials and ultimate martyrdom in the Gulag in the Soviet Union as his prominence in the North American Diocese during the nearly two decades he served in the United States. Yet the same cannot be said for Zotikov, even though his life, ministry, and subsequent fate were quite similar, and intrinsically tied, to those of Hotovitzky. Ilia Ivanovich Zotikov was born into a priestly family in Finland in 1863. He was educated at the St. Petersburg Theological Seminary, where his classmates included John Kochurov and Alexander Hotovitzky. 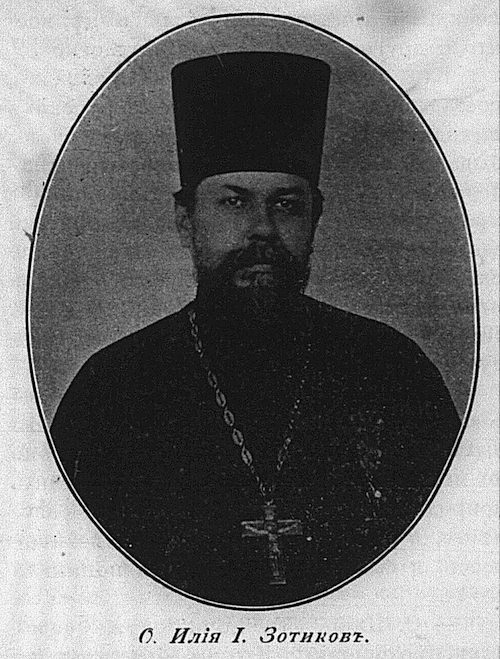 In 1895, Zotikov was one of a number of Russian seminarians recruited for service as missionaries in America by Bishop Nicholas Ziorov, Bishop of Alaska and the Aleutians. Zotikov was assigned to be an assistant to Fr. Evtikhy Balanovitch, and both were sent to New York City to start the small parish that would ultimately become St. Nicholas Cathedral. They arrived in New York with their wives, both named Mary, on April 1, 1895 (NY Sun, 4/2/1895). On May 19th, Bp. Nicholas ordained Zotikov to the priesthood in the parish’s tiny house parlor sanctuary at 323 2nd Avenue (New York Herald, 5/20/1895). When Balanovitch left St. Nicholas in 1896, Zotikov stayed on to assist Balanovitch’s replacement, his seminary classmate Fr. Alexander Hotovitzky, who had been ordained a priest in San Francisco earlier in the year. Together they were instrumental in both the growth of the congregation and the subsequent building of the parish’s new church on 97th Street, which would become the cathedral of the entire North American Diocese in 1905. Hotovitzky became the Cathedral Dean, and Zotikov the Sacristan. It was there that Zotikov officiated the marriage of my great-grandparents in 1908, and where, as my grandmother’s files revealed, Hotovitzky baptized their first daughter two years later. In the late summer of 1910, Zotikov returned to Russia. For most of the ensuing decade, he served in various parishes in St. Petersburg. In 1919, he was reassigned to Christ the Savior Cathedral in Moscow, where, alongside Hotovitzky, he served as Sacristan of the Cathedral and assistant to Patriarch Tikhon, in a nearly identical arrangement to that at St. Nicholas Cathedral more than a decade before. There, the Patriarch, Hotovitzky, Zotikov, and Cathedral Dean Fr. Nicholas Arseniev were on the front lines of the defense against the repression of the Church by the Bolshevik government. Both Patriarch Tikhon and Fr. Alexander would be arrested and imprisoned multiple times in the early years of Bolshevik rule. 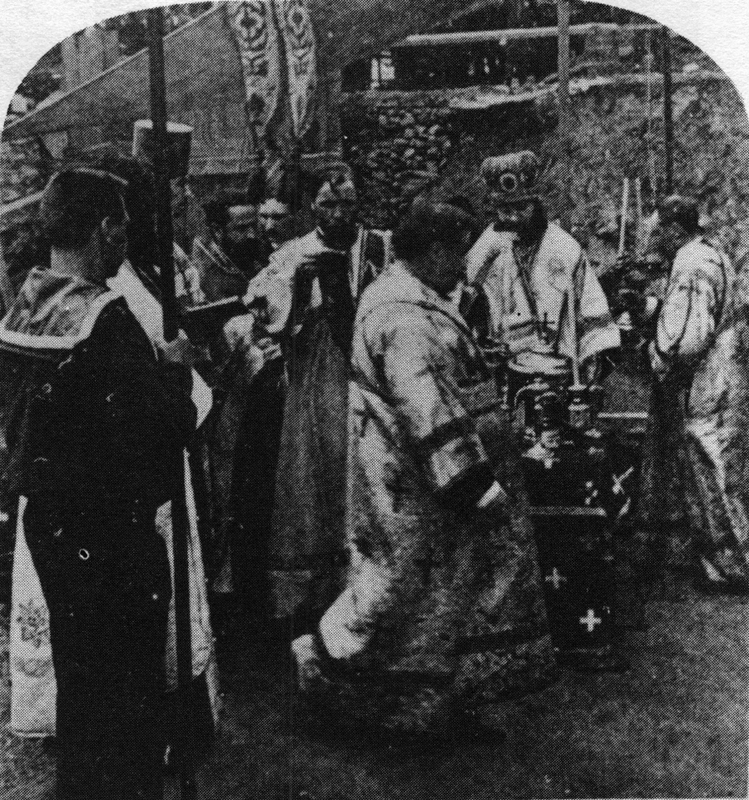 In early 1922, the Bolshevik government ordered the seizure of all ecclesiastical vessels and objects of value held by the Church. This was met with resistance by clergy and laity alike. 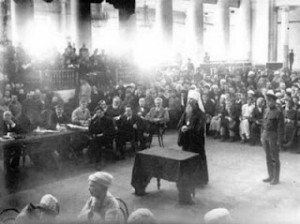 The clergy of Christ the Savior Cathedral, led by Hotovitzky, were especially instrumental in resisting the order, and meetings were held at Hotovitzky’s apartment to draft resolutions in opposition. For his participation in these meetings, Zotikov was amongst a group of clergy and laity arrested in the spring of 1922, and was subsequently sent to Butyrki Prison. In December, Zotikov, Hotovitzky, and others appeared before the Moscow Revolutionary Tribunal. Hotovitzky and two others were given ten-year sentences. Most of the others, Zotikov amongst them, were sentenced to three years’ imprisonment and one year of deprivation of civil rights. Appeals were unsuccessful, but in late 1923, many of the sentences were cut short on amnesty. Zotikov returned to Christ the Savior, and in 1924, was reassigned to the Descent of the Holy Spirit, where he remained for several years. Hotovitzky was left without a parish assignment, instead filling in where he was needed. Zotikov was arrested again in June 1927. Found to be in possession of the “Solovki Declaration,” a document issued by bishops imprisoned in the Solovki prison camp in opposition to the Soviet government, Zotikov was again imprisoned at Butyrki, put on trial, and sentenced to three years of exile in Vladimir, about 120 miles east of Moscow. There, he became rector of a small cemetery chapel then serving as the cathedral for the entire Diocese of Vladimir following the forced closure of Dormition Cathedral earlier in 1927. By this point in time, Soviet law had restricted the clergy from nearly every aspect of their vocations, leaving priests like Zotikov on dangerous ground as they attempted to perform even the most basic sacramental duties. By 1929, widespread arrests of clergymen were underway. In 1993, the Journal of the Moscow Patriarchate published an article by Andrei Kozarzhevsky about parish life in Moscow in the 1920s and 1930s, which sheds some light on this period of Zotikov’s life. (Thе article was recently translated into English and published on the Russian website Pravoslavie.ru.) Kozarzhevsky was baptized by Zotikov in 1918, and was well acquainted with both Zotikov and Hotovitzky in his adolescence. As a child, he assisted Zotikov during services in Vladimir, and recalled Zotikov’s third arrest, on October 13th, 1930, for “membership in a counter-revolutionary organization of churchmen,” that being the Church. On October 19th, 1930, Zotikov was convicted by the OGPU (the arm of the Soviet secret police who spearheaded the repression of religious groups) and was relegated to the notoriously brutal Vladimir Central Prison. On October 23rd, Zotikov was sent for execution. Some sources state both he and Protodeacon Michael Lebedev were shot by a firing squad, though Kozarzhevsky claims he suffered a fatal heart attack on the way to the execution. Regardless, Fr. Ilia Zotikov is considered a Hieromartyr, and is commemorated according to the church calendar with the New Martyrs and Confessors of Russia on January 25/February 7. Andrei Kozarzhevsky’s recollections of Zotikov do not end with his death. After Fr. Alexander Hotovitzky was martyred in the Gulag in 1937, Kozarzhevsky came into possession of a few of Hotovitzky’s personal effects, including a copy of a poem written by Hotovitzky in New York during the summer of 1910, on the occasion of a “triple event:” The feast of St. Elias, Zotikov’s name-day, and his imminent departure for Russia. By any measure, it is clear that Zotikov and Hotovitzky (and their wives) were particularly close, a bond which apparently began in seminary, yet was forged largely in America. 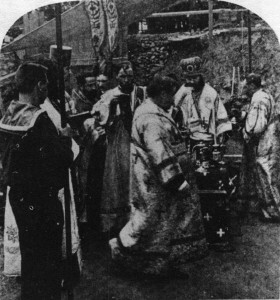 When Hotovitzky departed for Russia in 1900 to raise money for the building of St. Nicholas Church, it was Zotikov who officiated the service blessing his trip. When the church complex was finished, the Hotovitzkys and Zotikovs were neighbors in its apartments. Mary Hotovitzky and Mary Zotikov later served together on the board of the Cathedral Sisterhood. A note on sources: Much of the metrical data for this article, including the particular dates of Fr. Zotikov’s biography, can be found (in Russian) here. Additionally, biographical details and a brief biography of Zotikov can be found in The Holy New Martyrs and Confessors of Central Russia (Vladimir Moss, 2009, 657-8), available for download (along with other similar works) here. Vladimir Moss’s book is profoundly unreliable!